"Use your own strategy to deal with the fast paced atmosphere at a quality restaurant in Cooking Dash." As with a lot of simple cooking games, you are up against the clock to make sure you can get as much done within a certain time frame to make your customers as happy as possible. Cooking Dash goes the extra mile to make things interesting in that you must fill the shoes as one of the best chefs in town. As you progress through the game, you will level up to different restaurants that present you more challenges on your way to become one of the most well known and appreciated chefs of your time. 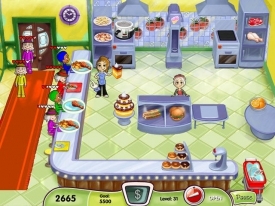 This is an originally cooking game that challenges you to satisfy your customers by helping seat them, take their orders, and then perfectly preparing their quality dishes as fast as you possibly can without forgetting about the quality of your restaurant. This game is also a lot longer than you would expect, with about 50 fun, challenging levels to complete as you progress yourself to the top. This is the deluxe edition of the game that gives you a few extra features you otherwise wouldn't have access to. You can choose between two challenging game modes: Story and Endless Mode. Story mode follows a specific path and endless mode is just that, it never ends and you can challenge your skills without the fun ever ending. With up to 50 levels of challenging fun, you must complete the assigned tasks in a fast-paced atmosphere. 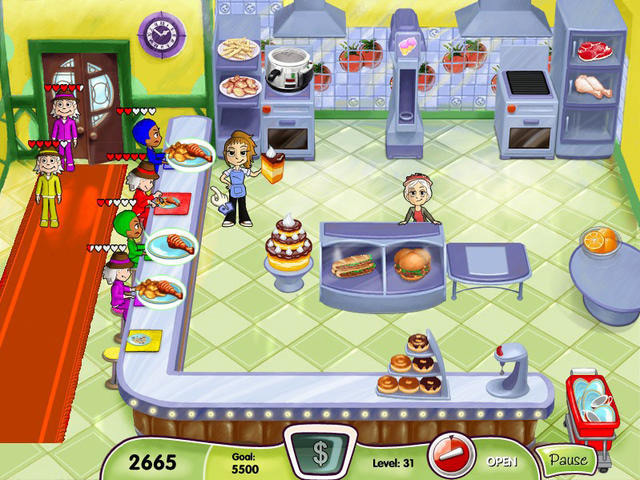 You go through the levels and end up managing five restaurants as you prove yourself in the game. Make sure you don't forget to pay attention to the quality of detail while you are rushing to complete the challenges!